The rosemary herb must be one of the most well known and versatile herbs around, and for this reason, Rosmarinus officinalis has gained great popularity on various fields. The herb in folk usage signifies friendship, remembrance and loyalty, but in cosmetic application has a variety of uses. Internally it is used for depression, apathy, nervous exhaustion, and headaches as well as poor circulation and digestive problems caused by anxiety. The therapeutic properties of rosemary include that of tonic, astringent, diaphoretic and stimulant as well as reducing skin fragility and is found in Cellumend cellulite cream. Topical use includes a help for rheumatism, arthritis, neuralgia, muscular complaints, wounds, dandruff, hair loss and reducing skin fragility while boosting the skin in general, since it has a great ability to increase circulation and also contains antioxidants which have anti-ageing properties as they reduce the damage caused by free radicals. The antioxidants contained in rosemary is the active element why it was used centuries ago to help keep meat from spoiling and to help fight infection - since the powerful antioxidant effect helps to retard oxidation and inhibits the action of some micro-organisms. It grows as a bush of between 0.5 and 1 meter in height and can even grow as high as 2 meters. The woody, foliate stems have narrow, opposite, sessile, coriaceous leaves with curled edges. The leaves are dark green on the front and whitish on the back due to a thick tomentum which covers them. The flowers are pale blue and gather in small auxiliary bunches. They have a small, bell-shaped bilabiate calix with 3 teeth, and the corolla is long with two very clearly marked lips, the first with two lobes and the second with three. Rosemary is widespread around the Mediterranean region and the leaves and the flower heads are the parts of the plant which are used. 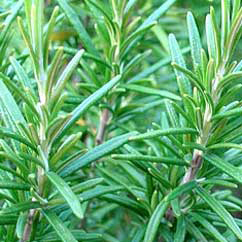 The main constituents of Rosemary include essential oil, rosmarinic acid, protein, tannin, borneol, boron, diosmin, camphor, saponin, bitters, flavonoids, resin, organic acids - such as phenolic acids and triterpenic acids. The essential oils are constituted by terpenic derivatives in concentrations of between 1 and 2%, falling to only 0.5% in the dry plant. The main derivatives involved are: a-pinene, usually found in its racemic form, camphene, 1,8-cineol, camphor and borneol. The therapeutic properties of Rosemary oil are: antiseptic, anti-spasmodic, anti-depressant, anti-rheumatic, carminative, digestive, diuretic, emmenagogue, hepatic, hypertensive, nervine, stimulant, stomachic and tonic. Rosemary oil has a pronounced action on the brain; it clears the mind and aids the memory, and assists circulation and is good to help with water retention and acts as a diuretic, poor circulation and varicose veins. Made up of caffeic and -hydroxydihydrocaffeic acid, found in quantities of 2-3%. Picrosalvin or carnosol. This di-terpenic lactone has two hydroxyl functions in o-position. Made up of flavone glucosides. Found in quantities of 2-4%. The ingredient Rosmarinus officinalis extract is used as an anti-microbial agent, skin conditioning agent (miscellaneous and occlusive), antioxidant and fragrance ingredient in cosmetic manufacture and chemically classed as a biological product.